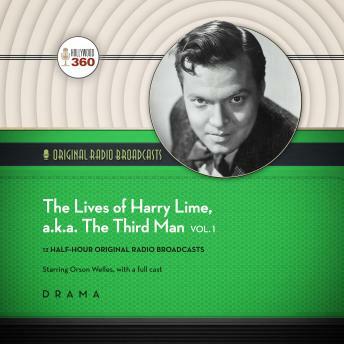 Made as a prequel to the hit film The Third Man, this radio show was created to follow the adventures of the popular character Harry Lime, played here, and in the movie, by Orson Welles. The 1949 film The Third Man won an Academy Award and was an international success, called "magic" by Roger Ebert and "one of the finest films ever made" by the New York Times. Written by New York Times bestselling novelist Graham Greene and directed by Carol Reed, the production starred Joseph Cotten as Holly Martins, an America who travels to postwar Vienna at the request of his old friend Harry Lime, played by Orson Welles. But it was the character of Harry Lime who nearly stole the show. While living in London, Orson Welles became acquainted with producer Harry Alan Towers, who convinced Welles to appear in a radio series based on his character in The Third Man and to be titled The Lives of Harry Lime. Since Lime meets his end in the sewers of Vienna in the movie, Towers, with Welles' involvement, decided to make the radio show a prequel. Produced in England and recorded in London's IBC Studios, The Lives of Harry Lime had an authentic continental flavor, with adventures taking place in such exotic locales as Paris, Rome, Venice, Tangiers, and the French Riviera.